All Personal Series: Nodding doesn't guarantee listening – so, what does? ‘No, that’s not what I meant’, or ‘You’re not listening to me’, or ‘I’ve just told you that’. Familiar? Why does this happen, when all we did was listen? We thought we were listening, because we were nodding our head over and over again, humming as well, and even maintaining eye contact. So why is it then that, at some point in the conversation, we get this feedback that we weren’t, in fact, listening. What is listening and what makes it so difficult? First off, we tend to treat listening as this passive thing we do (or don’t have to do?) when the other is talking. We look at it as ‘let them talk, while I can think about my ‘groceries shopping list’’. The brain is busy thinking about the next actions we need to take, even when we don’t want it to. This is how, especially when we think we don’t have to do anything, we’re always busy thinking about something. One of the most difficult things to achieve is to clear our minds, not think about anything, and those of you who meditate or ever tried to, perfectly know this feeling. Because there’s always a buzz, a hum, a thought, a fraction of an action hidden right there, in a corner of our mind. That’s how, instead of listening to what the other is saying, we’re busy trying to decipher our own thoughts all the while. Second, we prefer to tell our story rather than listen to someone else’s. Why? Because when I’m telling my story I’m more involved, I recreate the events, which makes me also re-experience some of the feelings, which, in turn, makes me so involved in the story. When another person tells us their story, it’s more difficult to get involved, we’re strangers to that story and it takes time to get a grip of what it is about. And unless the story teller makes it engaging (but that’s another story), we find ourselves thinking ‘shopping lists’ all over again. The ‘shopping list’ is our metaphor for everything else we’re thinking about: what am I going to respond to what they’ve just said now (which is already what they just said a while ago, because I don’t know what they’re saying now anymore, as I’m thinking about what I am going to say); piles of work, night out with friends, things I need to start doing right after reading this article, you get the picture. Third, we’re human. We can only focus for a little while, because we cannot help but pay attention to everything that’s going on around us. Yes, focus is the opposite of attention. Focus requires a lot of effort and us pushing every distraction aside. Focus happens especially when we’re in flow, ‘in the zone’, because that’s when we’re engaged, involved, motivated. Focus means I zoom in to you while you’re speaking, without paying attention to who comes in the room, to what happens in my mind, to the building shaking because there’s an earthquake. But, as I said, we can only focus for a while, and under these specific circumstances of involvement and motivation. And we already decided, we love our own stories more than other people’s stories. Which is why they don’t keep us motivated and engaged enough for us to get into that state of focus. So what can we do? It’s something we already do, just not all the time and maybe without being aware of it. Think about someone you care about, telling you they got the job they wanted. First of all, hear their voice and how they say it. They are usually enthusiastic, and enthusiasm is catching. When we respond, we do it without thinking about our shopping list. When we hear ‘hey, I got that job’ we naturally go ‘wow, I’m so happy for you’. We match their state of mind, because we care. Caring makes us focus on what they are saying. When I care about your story, I am there, with you, in your story. I bring my story there, because I can relate to yours now. And that’s how we can build a combined story – the story of ‘how you got that job and how we celebrated together’. Because when I care, I can focus, and that’s what makes me capable to understand: what you’re saying and also a bit of how you’re feeling. So now that I’m focused, I am interested, and the next thing I know is I’m asking you for more details: what will you be doing, when do you start, do they train you, how much do they pay you (ok, maybe not that, we'll leave that for the shopping list). It’s a natural reaction for us, to ask questions when we listen. I mean, when we truly listen. Listening is a verb - it’s an action. It’s not that I don’t have to do anything and ‘just listen’. On the contrary, there’s a lot of things I do that tell you I’m listening. Think about it: when we care and focus and truly listen, what do we do, apart from nodding and humming: we ask questions, we go back to make sure we didn’t misunderstand, we ask for clarifications, we summarize, we investigate further, we ask for the next steps. It goes all the way back when, as children, someone was reading a story to us and, because we were captivated by it, we wanted to know more, hear more, see more. Or maybe more recently when, at some point in our lives, we asked the question: ‘so let me get this straight, are you dumping me?’. That’s one piece of active listening! And all because I cared. The ‘recipe’ I am proposing is: start with the heart and zoom in on the mind (you add your own ingredients, in the quantities that work for you). When I care, I will instantly focus, and when I focus, I will be able to hear what you’re saying and actually understand you. I will nod and hum, and I will also ask questions, summarise, clarify, agree next steps, maybe take notes and make sure you get them, too. Once I listen to understand, I build the foundation for a long-term relationship. valued (or, even better, loved). And then, once we’ve truly listened, we get a ‘that’s exactly what I meant’, or ‘thanks for listening to me’, or ‘nobody else asked me that, thank you for checking’. Because when somebody listens to me and understands me, I feel I matter. Don’t you? I feel like for most of Winter, I end up in what I would call my "winter uniform": black pants, a cute top, and some form of booties. There's nothing wrong with this look, but it can get a little bit monotonous. I start to feel like I'm in a fashion rut. So I started talking with a friend, whose style I admire, about her winter uniform. Tracey has a great aesthetic; a lot of really classically designed, neutral pieces combined with tailored silhouettes. This is almost the opposite from my style. I love color. I like exploring new and out there patterns and textures. I decided to try to dabble in a little bit of what I would call "her style" and I have to say, it was not as easy as I thought it was going to be. In this post, I'm going to talk about how to step out of your bubble and find a new winter uniform. The first step in changing up your winter style is identifying what your current winter wardrobe is. Do you wear a lot of chunky, oversized sweaters and riding boots? Are you constantly in dark washed jeans? Are there any items in your closet you wear excessively? As I said before, a black Ponte pant, a cute sweater, and some form of boot is my winter go-to. I can admit that I am guilty of over using this outfit. Every now and then, I might mix it up by adding a blazer or a scarf, but the key elements remain the same. After identifying your current style choice, the next step is to look for something outside of those bounds. What do I mean, you ask? I mean look for something different in terms of silhouette, texture, or color. For me, I always wear brightly colored tops and black skinnies, so I decided to go with a more neutral palette and joggers. By changing both the silhouette and the color scheme, this outfit is already wildly different from what I would usually wear. These differences help to push me in a new direction and to expand my fashion horizon. The final step in creating a new winter go-to is to pay attention to the details. Accessories matter! The winter white clutch I'm carrying with this look really compliments the silver tone of the sweater. If I had chosen a black bag or even a camel colored bag, it would not have matched as well with the mostly navy look I was going for. In turn, the metallic of the sweater pairs well with the dramatic earrings I'm wearing. 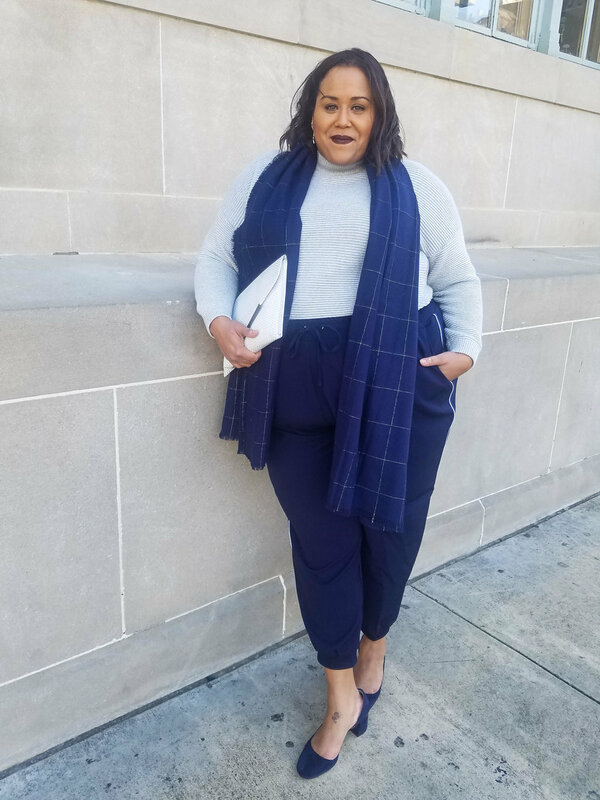 The scarf matches back to the pants and the pumps in a way that ties the entire look together. Each accessory is a small portion of the entire outfit, but it is an important factor in the overall look. Chelsea Madkins is a shoe buyer for Dillard’s department store. On the side she runs the fashion blog, Obsessions of a Fashion Nerd. It is her goal to help women feel not only more comfortable, but more confidence in and empowered by what clothing they wear. One of the struggles I face as a blogger (*gasp*) is how to constantly come up with new content without breaking the bank. I always want to make sure I am bringing something new and exciting to my audience. In this social media obsessed day and age, it is very easy to look around and see all the things you don't have and feel discouraged. This is something that I don't think anyone is immune to. When I look at some of my favorite bloggers, Rochelle Johnson, Gabi Gregg, and Anna Obrien it is easy to get a case of the wants. Having said that, I know that I cannot constantly be spending on clothing. It is very easy for a small shopping bug to get you into serious credit card debt. As a blogger, I have to budget for apparel like I would a business expense. So when I get the itch for something new but it is not in the budget, I turn to my closet and see what old pieces I can revamp to make feel new again. (You may remember the skirt from this post.) In this post, I am going to share five steps on how you can do the same. 5) Look at the new trends for the season and see what you are inspired by. For me, I am really loving the tapestry inspired looks and pearls. I have been seeing pearls as embellishments on shoes, apparel, and handbags. I like that both would add elements of sheen and texture to my outfits. Think about the trends you like and make sure they are things that are going to work with your overall look. It defeats the purpose if you have to buy another item just to wear whatever piece you revamp. What trends are you noticing for fall? 4) Go to your closet and look for an item that you may have once loved, but are not getting a lot of wear out of. Have you worn the item in the last four months? Could the styling of this piece work with the new trend? Is the piece very simple in its styling? Pearls are an easy trend to incorporate in an outfit; you can sew them on by hand. I scavenged mine from an old bracelet I no longer wear. The same less is more policy can work for the tapestry/embroidery look. A needle and thread will cost way less than a new skirt. 3) Develop a game plan for how to alter your forgotten favorite. For this skirt, I knew I wanted it to have a fuller body and that I wanted it to be shorter. This was simple to fix by cutting off a few inches and sewing on additional layers of tulle. I also wanted to have pearls thrown throughout the skirt in a random pattern. For this, I got a thicker thread to hand stitch the pearls on. The happenstance placement would allow the pearls to catch light throughout the skirt. 2) Gather the supplies needed to transform your piece. For me, it was extra tulle, pearls, thread, and a pair of scissors. Be sure to check around your home for things that can be reused. Walmart and craft stores are great to load up in supplies for future projects. The point of this entire project is to make it high fashion, but keep it low budget. 1) Alter your piece. There are a ton of tutorials on YouTube if you need help. I have been blessed that my mom taught me to sew at a young age. I started by creating two tulle ruffles and sewing them onto the elastic waistband. Once I saw how long the layers were, I shortened and hemmed the original skirt to match. The pearls were hand stitched on to finish off my project. I now have a one of kind piece that not only fulfills my need for something new, but acts as a creative outlet as well. Do you want to define your own brand, or do you want someone to define it for you? The answer SHOULD be that you want to define your own brand. If you don't, someone else will do it for you, and it may not be true to your authentic self. This is the biggest question I ask myself as I move forward in my career, where do I see myself, what do I want to accomplish? How do I want others to see me? What do other people describe me as? The team at NATIONAL suggested that every year you should aim to go for coffee with three people in your organization. Someone senior to you, someone junior to you and someone who you have differing opinions with. Ask them how they would describe you and the work you are doing to provide feedback and insight into the person others perceive you as. I struggle with this question, A LOT. I'm a jack of all trades, master of none. What sets me apart? What skills do I have that no one else does? Does my speciality have to be a hard skill like graphic design, or can it be a soft skill such as collaboration? I, and many other young women in my life, find it difficult to talk about ourselves, because we are afraid of bragging. But, your personal brand is all about what sets you apart, what makes you and your story bragworthy. Ask your friends what sets you apart, what amazing skill or quality are they jealous of? Where can I add value? You can ask yourself this question, but also those around you. Ask your co-workers how you can add value to them, or to the company. Ask yourself how you can add value to your personal life, or personal goals. Stay tuned for a future Personal Branding Workshop with Young Women in Business, Toronto - COMING SOON!